Met a girl, followed her to Turkey, these are the things I saw there. In 2003, when the shockwaves of 9/11 still echoed through the US and the country was fighting two wars in Muslim countries, I met a beautiful Turkish woman on an airplane and decided to follow her to Turkey. This is the story of what happened there. I figured adjusting to life in Turkey would entail some challenges, and I certainly wasn’t disappointed. I survived bomb attacks, lost my cool around beggar kids, drove a jewelry business into the ground, and got into fistfights over parking. Along the way though, I saw beauty in ruins older than the Roman Empire, learned about Bulgarian freedom fighters, tried not to hit cows in the road, and drank plenty of peach-flavored Lipton iced tea. 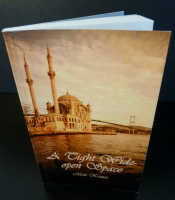 A Tight Wide-open Space is the story of falling in love not only with a woman, but with a city and a country. Read reviews in Today’s Zaman, one of Turkey’s English-language dailies, and Adventures in Expat Land. The book is available in paperback at Amazon and Barnes & Noble. It is also available for the Kindle. It is also available for free as a pdf.